At Rosenblum, we're famous for being all about Zinfandel – Old Vine Zin, High Altitude Zin, Single Vineyard Zin, BIG Attitude Zin. We love Zinfandel so much, we make over 20 different types. 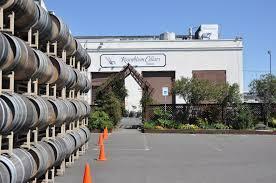 Rosenblum Cellars has some of the highest rated, most-awarded Zins from California's most highly regarded vineyards. Not just Napa and Sonoma, but all over the state. And while we are a founding member of the Zinfandel Advocates & Producers group (ZAP! ), we do make other amazing wines, including Rhône-style red wines like Syrah, Petite Sirah, Grenache, as well as Rhône-style white wines and dessert wines. Wine Enthusiast 91"While it’s not for everyone, this is a great expression of Rosenblum-style Rockpile Zin. It’s a big, lusty glass of red wine, warm and heady, with extraordinarily ripe berry, currant and mocha flavors." Wine Spectator 92"Well-oaked, with loads of spice, cedar and mocha notes. Underneath, this is an intense, rich, plush wine, with blackberry, wild berry and espresso bean. Drink now through 2009. 843 cases made." Wine Spectator 87"Ripe, rustic and a hint medicinal, but still appealing for its dried plum, licorice and smoky cracked pepper aromas and flavors. The tannins pack a punch. Drink now through 2012. 3,256 cases made."